NetEnt has developed games on many interesting and unique themes. Fisticuffs is probably the first one that is created for all the boxing lovers. It is the best because the use of HD graphics with boxing style symbols in a classic slot machine lures every online slot player. This game reminds you the time of 1900s, when boxing was a gentleman’s game and people used to pay a very high price for tickets of boxing matches. There are 5-reels, three-rows and 10 paylines in Fisticuffs slot and players can benefit from the both-way win feature of the slot. This game also brings some attractive features in your hands like straight wild, Re-spin and diagonal wild. You can win €10,000, if you wisely play and land on the best sequence of symbols. Lights are on, punches are flying and two boxers are ready to fight. That’s what you see when you play Fisticuffs slot game. The reels spin and boxers fight and if spinning symbols land between the boxers, they turn into wilds. Consequently, your chances of winning a great prize increase with this boxing feature. 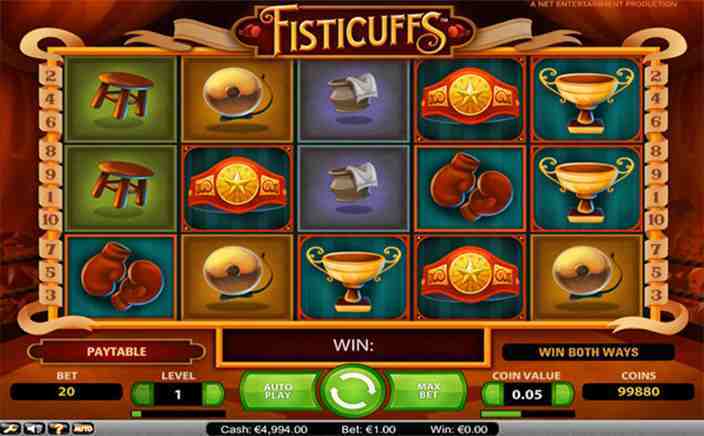 The minimum bet in Fisticuffs slot is €0.20 and the maximum bet is €200. Players are allowed to set bet limits, loss limits and playing sessions according to their requirements. All the symbols are related to boxing like a stool, boxing shoe, bucket, championship belt, the boxer and boxing gloves. This game features two different wild symbols, first is chucky chap and another is svelte contender. Chunky Chap is straight and Svelte Contender is a diagonal wild. All the bonus rounds take place during the base game, there are no special rounds for bonus games. It can be a lucky spin for you, if you succeed in landing on straight wilds on reel 3 and the diagonal wild is right beside him. It will punch the diagonal wild and that will throw all other symbols by replacing them with wild. Consequently, you will get more wilds on the reel to win a better price. You can also get some bonus if you get straight wild on reel 3, but no diagonal wild around it. Suppose you have land on straight wild on reel 3 and another wild at its diagonal position, all the symbols below and above the diagonal wild will become wilds and get frozen during the next re-spin. Stacked wilds appear only during boxing features Re-Spin. These stacked wild symbols land at reel 1 or 5 to improve the winning sequence of symbols. 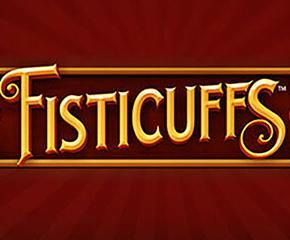 Another new game with Another new theme, Fisticuffs slot is a wonderful game from the house of NetEnt in which players can win up to €10,000 per spin.